Google+ provides an entire photo library built into the experience that allows users to view, upload, store, and share photos. Google+ photos are integrated into every element of the Google+ experience, allowing you to share those “Kodak moments” as they happen throughout your life. To get to your photos page, just click the Photos icon at the top of Google+ (indicated by the arrow in the following figure). The photos page appears showing photos of all the people you’ve circled. 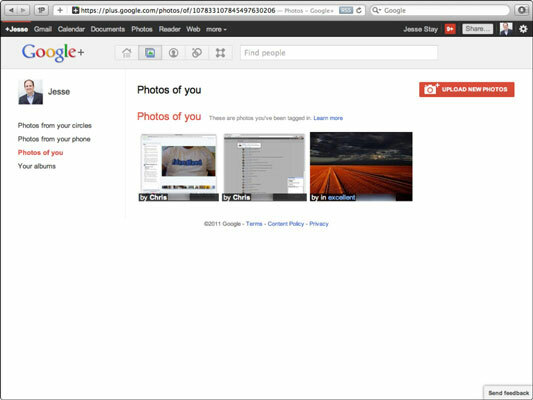 You can access the photos page in Google+ via the Photos icon. On the left side of the photos page are links of the types of photos you can view and on the right side are photos you’ve taken and uploaded. 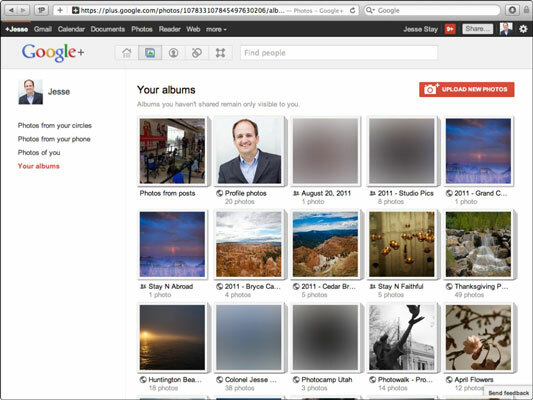 You’ll also see a button to upload more photos and below that a list of images from your phone or albums on Google+. The Photos of You link includes photos you’ve been tagged in by your friends. Ideally, these will be photos with you in them, but you do not actually have to be in the photo for people to tag you as being in the photo (see the following figure). You can, of course, change who can tag you in photos by editing your profile settings. The Photos of You page. To view photos taken of you, just click the Photos of You link in the left column of the photos page and click the photos to see larger versions of each. You can navigate through each photo by pressing the right and left arrows on your keyboard. 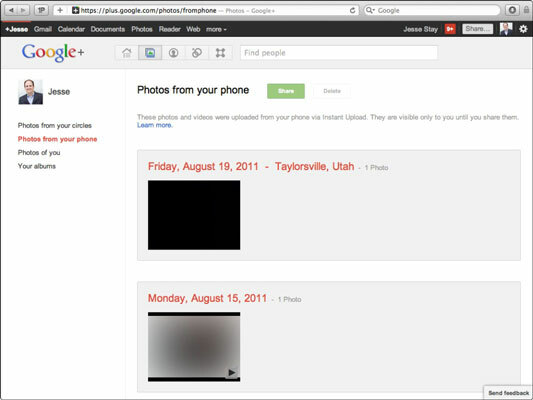 On an Android phone, you can choose to automatically upload your photos and videos to Google+. By clicking the Photos from Your Phone link on the left, you can view these one by one (see the following figure). The Photos from Your Phone page. 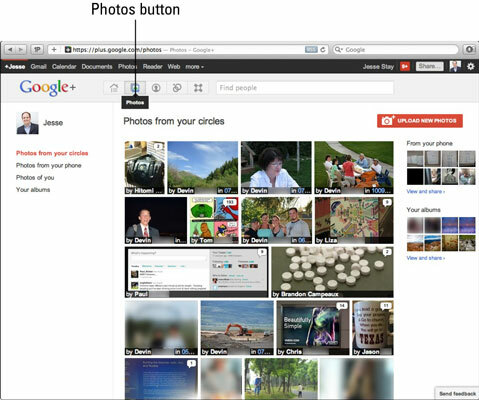 Google+ shows the option as Photos, but it really means Photos and Videos. If you’ve taken videos on your Android phone and enabled it to automatically upload photos and videos to Google+, you’ll see that the videos will appear as well. When you click the Upload Photos button, you can also upload videos with that button. To view photos or videos you’ve uploaded, just click Your Albums in the left column of your photos page (see the following figure). Photos from posts: As you post with photos, each photo you upload with a post is stored in this album. As a result, you can always go back and reference your previously posted photos if you like. Profile photos: Any time you change your profile picture, the new picture is stored in this album. You can go to this page to find an archive of all the profile pictures you’ve uploaded in the past. Photos from Blogger.com blogs (separated as albums by blog): If you have a blog on Blogger.com, any time you upload a photo or picture to your blog it will appear in this album. If you have multiple Blogger.com blogs, each blog will be represented by a different album, organized by the name of your blog.